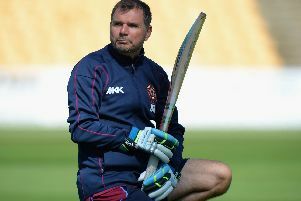 Head coach David Ripley says Northants are still working hard to bring in an overseas recruit as cover for injured all-rounder Rory Kleinveldt. Kleinveldt started to resume light bowling duties last weekend, but is still not expected back for a few more weeks as he recovers from a side strain. Seekkuge Prasanna has also been missing due to international commitments with Sri Lanka, though he is set to return to the County Ground next week. Northants have still managed to maintain their form despite the loss of key men, with the Steelbacks currently sitting top of the NatWest T20 Blast North Group. But they would like to add another established star to their ranks this week, with a big game at Birmingham Bears lying in wait on Friday night and a trip to Derbyshire Falcons following two days later. “A deal is still in the offing,” Ripley said. “We’re not there yet and there’s a bit of work to be done. “The deadline is probably Friday or maybe Sunday and if we can’t do anything by then, we’ll plough on with what we’ve got. Northants had been close to signing Kiwi all-rounder Tim Southee on a short-team deal, but they missed out on him after the New Zealand Cricket Board blocked the move. “We have a little bit in the budget that we can use because Seekkuge isn’t being paid by us while he’s with Sri Lanka, so we have a bit to play with,” Ripley said.